This book will encourage and empower readers to engage the culture as bold witnesses for Christ. Too many Christians in America are being intimidated into silence and inaction. The sound advice and solid counsel in this book will help believers break free from the false constraints of prevailing legal misconceptions popularized and perpetuated by the anti-Christian secular Left and its allies in law, media, education, and entertainment. By reading this book, Christians will learn that the law does not require them to sit passively on the sidelines of American life! Each chapter begins with a short fictional vignette drawn from real-life controversies and circumstances. The vignettes are engaging, but intentionally unresolved, setting the stage for the legal counsel to follow. The tone of the counsel is relaxed, simple and direct, without confusing "legalese" or complex academic jargon. The relevant concepts are boiled down to plain English, and each chapter ends with a bullet-point action list of key take-a-ways. What are our legal rights as Christian citizens in a post-Christian America? 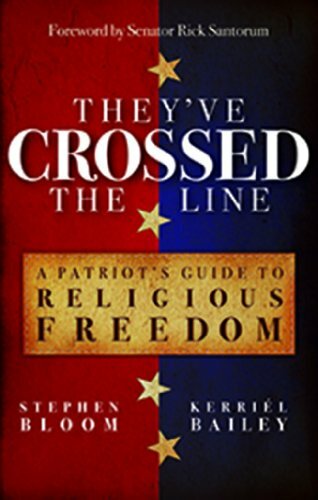 They've Crossed the Line: A Patriot's Guide to Religious Freedom provides concise easy-to-understand legal answers for the everyday religious freedom questions Christians face in their communities and lives. And there's good news. In most cases, the law says, "You have the right to be a Christian at school, at work, and everywhere else!" Stephen Bloom is a lawyer with 25 years experience, now of counsel at Irwin & McKnight, P.C. In 2010, Stephen was elected to the Pennsylvania General Assembly, where he represents the 199th legislative district. A frequent media guest and speaker, he was an adjunct instructor at Messiah College, a columnist for Crosswalk.com, and host of the "Practical Counsel - Christian Perspective" radio program. Stephen has been active in leadership of numerous community and ministry organizations. He is a longtime member of the Christian Legal Society. Residing along the Blue Mountain, near Carlisle in Pennsylvania's beautiful Cumberland Valley, Stephen and his wife, Sharon, are blessed with three grown children, one daughter-in-law, and one grandchild. Kerriel Bailey runs an active solo law practice. A graduate of Regent University School of Law, she held a legal clerkship with the American Center for Law & Justice and a judicial internship with the Honorable Judge Dewey Lawes Falcone of the Los Angeles County Superior Court. Kerriel served as Assistant Editor of the American Bar Association's Solo Newsletter and belongs to numerous professional organizations including the Christian Legal Society and the Federalist Society. She and her husband, Kurt, reside in Virginia Beach, Virginia, and they have two grown children.